We encourage the use of bicycles, buses, shuttles, carpools or other public transit to and from the event. This year Park City Mountain Adventure Park has invited us to hold our opening ceremonies in their main commons area. They have also created a group discount for our participants this year. Ski Town Staff will be at the Park City Mountain Adventure Park from 5:30pm-6:30pm for you to check in your team for the tournament as well as tryout some of the fun activities at a discounted rate. Park City Mountain Adventure Park is the place to be this summer! Coast, Zip, Slide and Discover! Hours are Monday-Saturday 10am – 8pm and Sunday 10am-7pm. Group discount vouchers will be available at the opening ceremonies as well as throughout the weekend’s tournament. Bring a voucher to the window to receive discounted rates on activities at the Park City Mountain Adventure Park! Ski Town discounted rates include full day Adventure Pass at the group rate of $60 for anyone over 54” tall and $40 for anyone under 54”, also an exclusive to group offering of the same Adventure Pass but valid from 4pm-8pm at half of the window rates (window rates $80/$50, our group 4pm-close passes are $40/$25). Thursday night during the opening ceremonies Legends nightly special will be Tacos, Nachos and Tequila and they will also be setting up a BBQ venue selling: Baby Back Ribs, Pulled Pork sandwiches, and either turkey legs or BBQ chicken thighs served with chips and slaw for $10. We invite you all to be a part of the tournament opening ceremonies. This is a fun and unique piece of the tournament, so make sure your team shows up and participates in the parade. We highly encourage face paint, banners, costumes, flags and anything else to show your team spirit! No Team Fee refunds on or after Wednesday, May 1, 2019. All Players will still register individually ($0 cost) for the Tournament for Waiver, Communication & Insurance purposes. Click on Team Registration above to register your team now! Celebrate the Creator’s game with us. 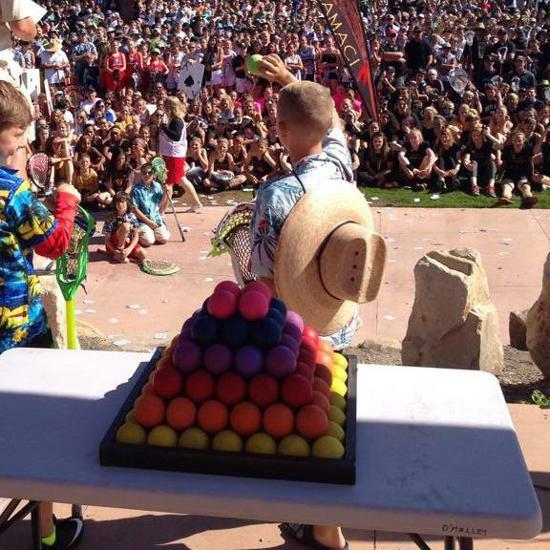 In our opening ceremonies, players from each team participate in the “Running of the Balls”, building a multicolored lacrosse ball pyramid. Each level of the pyramid represents the people involved in the game. The base is your teammates, followed by coaches, officials, opponents, and family. Throughout the event, we ask all participants to instill in the players a sense of honor, respect, and appreciation for the roots of the game. ©2019 Ski Town Shootout / SportsEngine. All Rights Reserved.